Here are my picks for summer Beach Bag Essentials! I have many of these items and love them all! And what I don’t have, is on order! Yes, there are many items my kids throw in the beach bag as we head out the door (like goggles, fins, etc), but these are important items (besides towels) I won’t leave home without! Maui Jim Sugar Beach Rimless Rectangular Polarized Sunglasses – I have these sunglasses and I LOVE them! They are so lightweight and comfortable! Maui Jim glasses are polarized, without glare and salt water safe! I have light-sensitive eyes and Maui Jim’s are my go-to sunglasses! Sanuk Women’s Spree 2 Yoga Mat Flip Flops – I have 2 pairs of these super comfortable flip flops! Again, LOVE them! O2COOL® ArcticSqueeze® Insulated Mist ‘N Sip® Squeeze Bottle – These are my kid’s favorite summer water bottles! The bottles are insulated and have a unique misting feature to cool off when its hot out! Great for the beach or pool! Aruba Mesh Beach Tote Bag with Insulated Picnic Cooler – This is one of the items that I don’t have. I actually applied to review it and if I am not selected, then I am buying it! Here is what appeals to me: The top is a mesh bag, perfect for the beach or pool. The bottom has an insulated zipper compartment! I will be adding water bottles and an ice pack in this. We take short trips to the pool most summers and I usually carry a small cooler for waters. This will be a great space saver for me! Crochet Hollow Out Swimsuit Cover-up – My daughter and I both have this cover-up. She has the one shown above and mine is cream, blue and gray. We brought them on vacation and received countless compliments! I even used mine over a tank top with shorts one day when we went shopping. I was stopped at least 4 times complimenting it! It fits like a tunic top, not a dress. It is so pretty and looks so flattering on us. I really LOVE this A LOT! Siggi Womens Summer Flap Cover Cap Cotton UPF 50+ Sun Shade Hat with Neck Cord – I don’t have this particular hat, but one very similar. My favorite part is the UPF 50+ sun protection and how it folds up so easily when traveling with it. Johnson & Johnson Red Cross Save Travels First Aid Kit – If you have kids, it really is a good idea to carry a first aid kit in your beach bag. We have needed bandages more than once while visiting the beach or pool. Kids step on sharp shells, play on rocks, etc. Better safe than sorry! Camco 60″ x 78″ Handy Mat with Strap – We’ve had our mat for a few years and it is great! We use it for the beach, picnics and the park. Its made of durable polypropylene, is weather-proof and mold & mildew resistant too. Easily cleans with soap and water. Light-weight and folds up easily. Goody Hair Elastics – We always keep some in our beach bag, purses, cars, backpacks, etc. If you have medium-long hair, then hair elastics are essential for the beach! Who doesn’t put their hair up or back at the beach??? Supergoop! Fusion Lip Balm SPF 30 – I don’t have this this soothing, hydrating lip balm, but I really want to try it. I’ve seen many good reviews! Neutrogena Wet Skin Sunblock Spray SPF 50 – I am a fan of Neutrogena sunblock. We have a variety of types both cream and spray. We used the wet skin type on vacation to reapply while swimming at the beach. We really like them all! Baby Powder – Even after rinsing off as you leave the beach, most of us still end up with a fair amount of sand on our feet. Once you get to your car, sprinkle powder on the sandy areas and watch the sand brush right off! I only learned about this a couple of years ago and it is my greatest beach tip! IT WORKS! Of course, be sure to hydrate and keep yourself protected from excessive sun exposure. So there you have my Beach Bag Essentials! 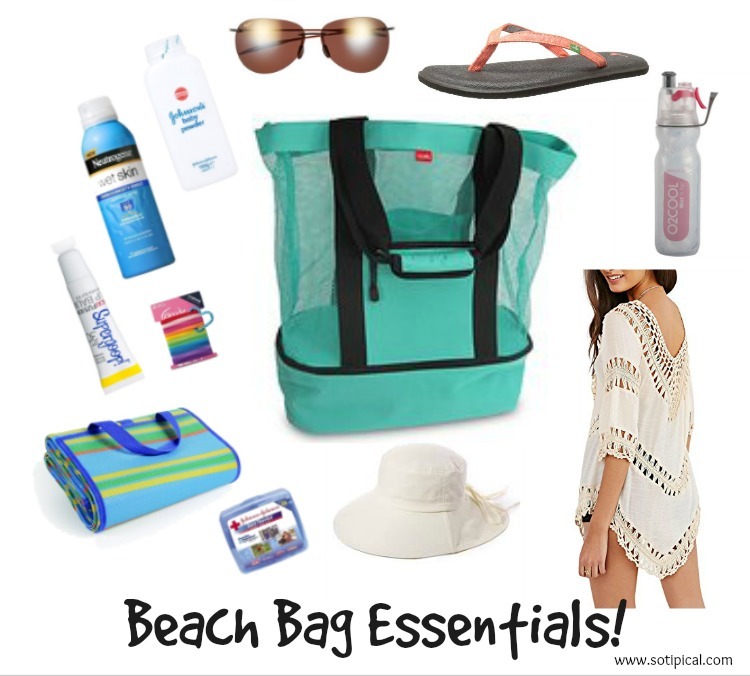 If you have any favorite beach bag essentials to add, please let me know in the comments! Disclosure: This post contains affiliate links, which means I may receive a commission on items purchased. Commission helps to maintain the running costs of this site.